This terrific Cast Glass Inverted Dome has fluted details on the bowl and egg and dart details around the rim and the canopy. Cast glass is a heavy glass when compared to blown glass because it is made from molten glass poured into a mold. The french call this type of glass parian The bowls shape flows down to a soft tear. 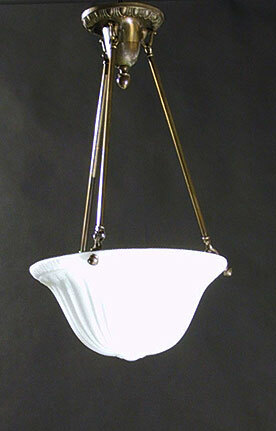 Circa 1915, this Antique Light measures 24" length by 14" diameter.